Join the course and begin designing pixel art games and animation today! Do you want to learn how to create pixel art and animations? Or maybe you’re on a quest to start making money as a game graphic designer? In any case you’ve come to the right place. The Learn Professional Pixel Art & Animation for Games course will show you how to create high quality stylized pixel art and animation that will stand up as professional work. The techniques taught in this course can be translated into just about any asset creation for games. This course will enhance or give you skills in the world of digital art creation – or your money back! The course is your track to building amazing attractive pixel art games! Whether for your own games or for other peoples projects. This course will take you from having little knowledge in Photoshop to creating professional pixel characters, animations, backgrounds, and maps in as little as 1 week. So what else is in it for you? You’ll create five different projects in this course that will take you from beginner to expert! You’ll gain instant access to all six sections of the course. You’ll also gain access to all of my Photoshop files and sprite sheets that I create though out the course for you to use how ever you like. These assets can be used in your own games or just to study and trace over. The course is setup to quickly take you through step by step, the process of creating pixel art and animating it in Photoshop. It will equip you with the knowledge to create stunning designs and animations for pixel games! Don’t believe me? I offer you a full money back guarantee within the first 30 days of purchasing the course. You’ll get access to the six sections of the course that will show you how to design, create, and animate pixel art from the ground up. The course is supported with over 4.5 hours of clear content that I walk you through each step of the way. All at your fingers tips instantly. The course starts with the basics. For those of you that have never used Photoshop I’ll walk you through the basic tools we’ll be using and show you how to set up the program for pixel art creation. Next you’ll learn the basics of pixel art, shape, value, and color. Once you’ve learned the basics of pixel art you will build your first two pixel art assets. A wooden crate and a red ruby that you will then animate to rotate and sparkle. At this point you’ll be ready to design your first pixel art character and animate them. You’ll animate three animation cycles. The hover cycle, run cycle, and jump cycle. Next you’ll design and build a background for your character. The background will have multiple levels and also some animated water falls. Lastly you will learn how to build a game map with reusable sprite tiles and assets. These tiles and assets can be used to create an map you want. This all comes under one convenient easy to use platform. Plus you will get fast, friendly, responsive support on the Udemy Q&A section of the course or direct message. I will be here for you every step of the way! So what are you waiting for? Sign up now to start building your pixel world! 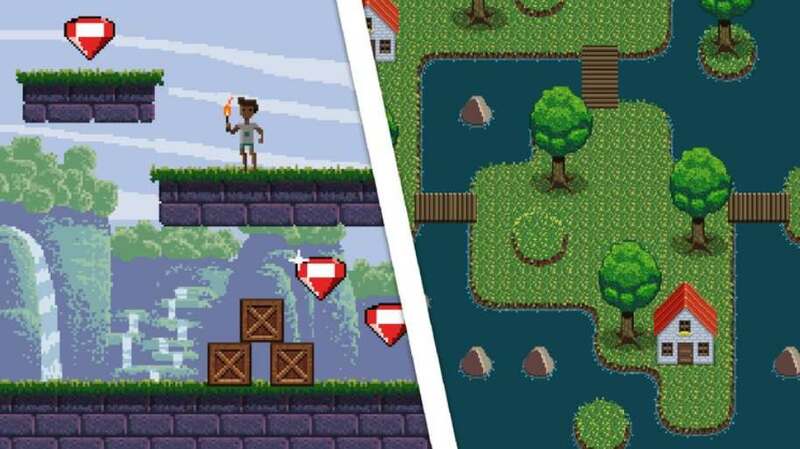 Get your Free Udemy Course on Learn Professional Pixel Art & Animation for Games by clicking here.